How do you make families and schoolchildren interested in Science History? The Technical Museum in Helsinore (Hamlet Castle city) has chosen a solution where the visitors become actively involved. They must perform the same trials that led the three scientists; Volta, Oersted and Faraday, to discover concepts such as electromagnetism and induction. Without these discoveries we would not have mobile phones! No Parking has developed the solution, which can be run on 2 stations in the museum’s new exhibition on energy. 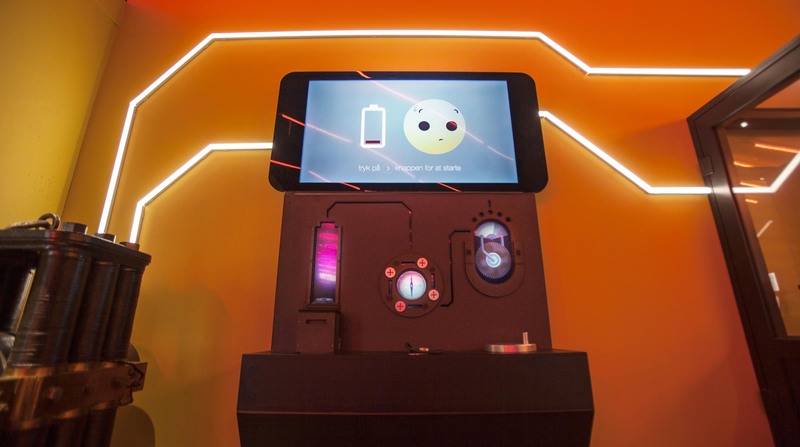 At the top of the stations there is a large cell phone, with a smiley that signals that its battery is running dead – and it’s now up to the visitors to help charge the phone. This is done by performing tactile experiments at the lower part of the exploratory stations. After watching a video explaining the concept, they must; build a Volta battery, affect a compass by electricity, and rotate a generator at the right speed – all in order to get the most power on the grateful mobile phone. No Parking has designed the exploratory stations and developed the tasks in collaboration with the Technical Museum. The stations use several types of sensors and mechanical parts, which together allow for tactile experiments. The large screen above communicates with users and displays current results. There are several screens below, integrated into the physical structure that give direct feedback in relation to the interaction. Once a task has been completed, a strip of light that leads to the exhibition’s objects will light up. All in all, the history is activated and made alive in a fun and exciting way.